BBC NEWS | Have Your Say | Should Charles marry Camilla? The Prince of Wales is set to marry his long-term partner Camilla Parker Bowles on Friday April 8th, Clarence House has confirmed. The wedding will be a civil ceremony followed by a service of prayer and dedication in St George's Chapel. After the marriage Mrs Parker Bowles will take the title HRH Duchess of Cornwall, changing to the Princess Consort when Charles becomes King. The heir to the throne was previously married to Princess Diana, who died in a car crash in Paris in 1997. What is your reaction to the proposed marriage of Prince Charles and Camilla Parker Bowles? Should Prince Charles marry Camilla and should she be allowed to become Queen? Yes, they should get married. Life must go on, and it's about time they got on with theirs. It also marks a return to a proper family unit. That's what I'd like to see - a settled complete Royal Family. Welcome them to the real world that the rest of us live in. Good luck to them, as long as they fund it themselves, and it doesn't cost us, the taxpayers a single penny. Wonderful news and obviously with the blessing of the Queen, William and Harry. I wish them all the very best and hope their future is happier than their past. Am I the only person in this country who has no interest in the Windsor/Bowles saga. Just don't charge anything to tax! This is the best news to have come from the Royal Family in many years. I am delighted and wish The Prince of Wales and Camilla Parker Bowles Congratulations and Best Wishes for a long happy life together. I am so pleased for Charles and Camilla who should have been allowed to marry in their youth. I have always felt sorry for Diana and Charles equally. Diana because she was so young and probably truly felt in love and Charles because he was not allowed to marry the one woman he truly loved and therefore, was forced into a marriage of someone else's choosing. Both of them were victims here and so much heartache could have been avoided back then. The one good thing that came from that marriage were the wonderful princes Harry and William. I wish Charles and Camilla all the happiness in the world, that at last after 35 years they are allowed to be together and see out their days with each other. The monarchy has moved with the times and by some are now being criticised, seems to me they can never win! They should not marry. It's absolutely disgraceful. If they loved each other so much they should have got married all of those years ago before they ruined so many lives. I will never accept Camilla as Queen, she will destroy the monarchy if she becomes Queen. If he has to marry her, he should abdicate. Diana, Princess of Wales, will always Queen in our hearts! I feel it is right they should marry as it is clear they have had a long standing relationship and everything that has since happened would have been in vain. However, I am hoping that the occasion will be very low key and private, and no public appearances will take place. I think it's a mockery of the institution of marriage. The man has already been married before and should not be allowed to do so again. I feel sorry for his children having to go through this. As a women whose family broke up due to adultery I find it sickening. We could do with a bit of pomp and circumstance, so I hope they push the boat out. As for using taxpayers' money, even if it costs £5 million, it's still a drop in the ocean compared to how much gets wasted on far less important activities. As for whether it affect Charles' fitness to be king, at least he's marrying for the right reasons (i.e. love) this time and not so he can have attractive offspring. Should've done it sooner in my book. Why should we see our greatest national institution be eroded because one man wants to have his cake and marry it? Tradition is about all the Monarchy has left. To Charles I say - Do the right thing, renounce the throne and have a happy life. I hope that they will be very happy. I think it is a far better example to marry one's partner than just to have her as a mistress. I do think though that he should not take the throne and he should let William become King when the time comes. As a Brit abroad, I am outraged that the moral fibre of society is so accepting of adultery. I firmly believe that being unfaithful should not be tolerated and certainly not commended by the reception of a title. I hope that the next generation throughout society cleans up its act. Certainly he should. He deserves to spend the rest of his life with a companion he can love and respect. Most people seem to agree that they should get married, but almost certainly it will speed the demise of the monarchy if Camilla becomes queen. Charles should do the honourable thing by passing the title of King to William. Oh, for goodness sakes. What a fuss. I say congratulations to them. So why doesn't everybody stop being busy-bodies and let them get on with their lives. I wish them all the happiness. Wonderful to see how two obvious soul mates have stuck together through thick and thin. Cheers to King Charles and Queen Camilla! Charles should as common courtesy, stand down as a future King and live in peace with Camilla. Although not too many of us say it out loud, there is very much a lack of respect for Charles as he has always gone his own way. Let him learn something from his Mum! They have the right to marry each other. But their past behaviour has made them very unsuitable for royalty. All those time when he was married to Diana and still have a "close" friend in someone else other than the wife! Royalty have its place in the modern society. But the character and behavioural standard are much higher than the common man. Royalty can bind the nation (look at other countries) but they themselves must live by higher standards. This is a disgrace and I am disgusted that the pair of them would think to devalue Diana's memory in this way. Camilla may be Queen of England, but they'll only be one Queen of Hearts! I think Charles ought to do the decent thing, marry the women he undoubtedly loves but give up his succession to the throne. He can't have his cake and eat it! Of course they should be allowed to marry and I hope they're very happy together. However by doing this he should forfeit his right to the throne. The thought of a Queen/Princess/Consort Camilla is too appalling to consider! Defender of the Faith? I don't think so! I am delighted that Prince Charles is to marry Mrs Parker Bowles. They have been through an enormously long and difficult time together and I hope that they, as a married couple, will a receive an open-hearted and generous welcome from the people of this country. God bless them. I have no objection to Charles marrying Camilla but I don't feel he should ever be king or that she should be given the title of HRH which was taken so needlessly and cruelly from Diana. It may be a great love story but it was built shamelessly and thoughtlessly on someone else's broken heart. Neither he nor Camilla deserve to represent the nation. Why on earth not? The antis in the Diana camp seem to forget she was by no means a saint; the antis in the religious camp seem to forget about forgiveness; the antis in the monarch purity camp are not living in the real world. The world appeared to want royalty to be more 'open' - was this only to allow the sanctimonious to air their views? I'm indifferent. Two people both of whom are irrelevant to the running of this country, anachronisms in their own right. Let's see how long this hypocritical family takes before they try and make this woman Queen. This man is an embarrassment to the UK and should never be King. I am so pleased that, after all this time, Charles and Camilla are going to be allowed to marry. To finally publicly ratify their devotion to each other must be a joy to them both. It is time for royalty to keep the job titles of prince and princess but drop the snobbish "royal Highness" along with the curtsey as we know they are just as fallible as the rest of us. I hope they'll be happy but I would not bend the knee to either of them. I have no objection to Charles marrying Camilla but I do strongly feel he should never be King of England and she should definitely never be a Princess. I will never forget the memory of Diana and how he deceived her on her wedding day by having a relationship with Camilla. I strongly feel that the majority of people feel the same as me and that it is the media who tells us that we all accept Camilla and feel the time is right for them to be married. We do not! I think it's a pity they didn't do this 30 years ago and save everybody concerned a lifetime of heartache. Of course, they both deserve to be happy so good luck to them. At the end of the day though, I don't really care. How much difference will all this make to me? Not a lot probably. Congratulations to the Prince. There was never any clear cut evidence that Camilla contributed to the downfall of his marriage to Diana and as far as I'm concerned if William and Harry are happy about it then so am I.
these people should set an example for the nation, this is not done by condoning divorce & infidelity. I disagree with the whole situation, this is the end result of a plan set in place many years ago, it has made a mockery of marriage and the monarchy, these people should set an example for the nation, this is not done by condoning divorce & infidelity. Prince Charles should abdicate the throne if he insists on marriage, and pass this duty to a morally upstanding trained person, his son. Prince Charles should wed Mrs Parker Bowles if that what he wants but he should not be King. How easy it is to look down from the pedestal and find fault and immorality in others whilst blindly stumbling along our own life walk. Although I am an avowed and proud Australian republican, I wish Charles and Camilla all the best in their future life together. What I cannot understand is why so many people feel it is their business to disapprove at all. Get a life, I say. I wish them well, I am sure this is a true love match this time and it has certainly stood the test of time. But I do think it is insensitive of them to bestow the title of HRH on Camilla especially as it was taken away from Diana. I have no problem with Camilla being the Duchess of Cornwell just the HRH title!. What relevance do the Windsors have in the modern world? Despite Charles's attempts to have it all (another marriage and bending the constitution to best suit his own requirements) I don't really care. It's the 21st Century and what relevance do the Windsors have in the modern world? Just sorry I have to subsidise them! Yes, of course they should marry - it's long overdue. I'm just bothered that the wedding won't be as big an occasion as some previous Royal Weddings! I think it is wonderful news. I think they have chosen the right titles, both for once wed and for when the Prince becomes King. I do not think that Camilla should ever be made Queen - Princess Consort is a good compromise and it's not really setting a precedent. Good for them! I was somewhat sceptical at first, but they look so happy. Good luck to them and I hope they have a wonderful life together. I would urge anyone who condemns the morality of Charles' second marriage to look hard at their own lives and those of their friends and relatives. It seems especially absurd to bring Princess Diana's name into the equation; eight years after her death, what does she have to do with it? We are all human and the mistakes Charles has made only serve as a reminder that he shares the experiences of many of his future subjects. This can only be a good thing for his future service of our country. I hope they have many happy years together. A Royal family heirloom ring on Camilla's finger shows bad judgement. He should give up the throne. He is a total embarrassment as a future King. The Prince and Mrs Parker Bowles obviously love and support one another and seem well-suited. Why should HRH be denied the chance of a happy and fulfilling marriage, because the first union was not a success? It is not compulsory for Royals to have a title as Princess Anne has shown with her own two children, so why does Camilla have to have one? Especially with the controversy surrounding her. It should be enough that she has finally got her man. It is time they both had some happiness. In this day and age there are many people divorced, living together, whatever. Why can't people leave these two alone to be together now? I don't have a problem with them marrying, I just don't believe that she should have a title of any sort bestowed on her. Good luck to them, it's their life, let them get on with it and be happy. Let them get married, it's no big deal. Diana's legacy will live on through her two beautiful sons. Divorce and re-marriage is part of modern society and of course Charles and Camilla should be allowed to marry and live happily ever after. The problem is people don't take their wedding vows in front of millions of viewers, as he did in 1981 whilst at the same time loving another. That was blatant dishonesty, not only to Diana but his nation. By all means marry his 'true love' now, but he is not fit to be king. How many people get a real second chance? Good luck to them. For those calling for Charles to abdicate in favour of William, have they considered William at all? Is he ready? Does he want the throne or is he too young to decide? I can't stand the thought of Camilla being HRH after not allowing the mother of the future King, William, to keep it. Why do I feel sad at this news? I loved Diana and think she was treated appallingly. How fickle the British public are to accept this marriage so readily. I don't think Charles should be King a king should be someone to look up to I have always been a Royalist but not anymore. If he wants to stay with Camilla all well and good if that's what makes him happy but he should abdicate otherwise the monarchy becomes a mockery. I totally support the marriage of Charles and Camilla. It is obvious that they should have married when they first met, but circumstances did not allow it. It will be eight years since the death of Diana, more than a suitable period between her death and Charles' new marriage. Camilla will never be known as Princess of Wales and will never be called Queen, a decision which shows how the opinion of the British public has been considered before the marriage was announced. Most importantly of all Princes William and Harry have given their blessing. I hope it brings a new era of happiness to everyone in the Royal Family. On one hand, it's a moral improvement, that they marry, as this puts an end to their adulterous affair. On the other hand, the marriage is like a seal of approval. It's like saying-who cares about my phoney marriage to the deceased Princess, who cares about all of the Princess' personal pain and humiliation. The marriage also emits a sort of go-ahead for society, in general to do this sort of thing. Everyone knows about the Camilla affair, and the humiliation and suffering that the Princess and children went through. I think it's great, they deserve to be able to live openly and happily together. We should move on as a society and not be hypocritical in demanding standards from others that most of us do not adhere to. Long live the Queen! If Charles becomes King I may well want to resign as a 'subject'. Why? If I were ever to be awarded an 'honour', I'd had to have respect to the person giving it to me. Let Charles and Camilla do their own thing, but please let's abolish this monarchy tradition, it has no relevance in the 21st century. If we need a figure head let us vote for a president. Hereditary peers are on the way out, why not Royalty, the hereditary line was lost way back with Henry Bolingbroke if not before. Congratulations great news. I am not a royalist, but respected the work Prince Charles did for The Prince of Wales Hospice in Pontefract when I was employed there. As I am a regular attendee at a C/E church and married to a C/E priest. I am saddened that the church is not marrying him. What hypocrisy that the church will bless a marriage it will not perform. Let's look at the real world where many priests have remarried within the church. Thank God he/she is about new beginnings, forgiveness and love - when will the church catch up? I would like to see Camilla as Queen. Wishing the Royal couple every happiness. It certainly seems as though their relationship has withstood the test of time, but it is a bit sad to see all that has happened while trying to deny or suppress the relationship. There has been quite a bit of heartache as a result of it. I think it's fair for them to be able to marry, but with a recognition of the circumstances. In short, I have to question the mindset that sent him off marrying someone else while clearly not committed. From a child's perspective it seems insane that Charles needs "permission" and approval from the public to marry Camilla. If they love each other they should be together regardless of whether she's divorced or not and I hope they are very happy together. Congratulations, a happy Charles will be a good king, Camilla a good consort - it should have happened 30 years ago when they first met. My most warmest wishes to them both. I think this is an absolute disgrace, the Diana inquest isn't even finished and they are getting married! Charles should not be allowed to become king if he marries Camilla. Good luck to them - they have been together for 35 years so they are clearly soul mates. They should have been allowed to marry when they were young and then we would have avoided all the heartache and tragedy of past years. And if William and Harry approve all the better. I am a British subject who is against this marriage, and very shocked that the church is allowing this as the monarchy is the head of the Church of England. They should set an example and Charles should not be allowed to be King. A sense that there is more to this than meets the eye. The marriage is rather sudden, less than two months away. Perhaps one or the other is ill and they want to do this before something serious happens? They deserve each other, but their country and the world deserves better! They too should be exiled to France or better still to the Falklands! Charles should forfeit his right to the throne in favour of his son William. How convenient the announcement just when Charles' financial advisors are going to be asked were did our tax money go as regards Charles and Camilla's travel expenses, etc. I don't think Charles and Camilla should marry. I think it is absolutely disgusting. I think that the whole country has gone as low as low can possibly be. I think it is wrong that he should be allowed to marry when the Church of England clearly states that a divorcee should not marry again. And as for becoming king, I think that should be out of the question. In conclusion a diabolical story! As a Brit, I am very happy for Charles and Camilla, he deserves some true love in his life. William and Harry's blessing must mean a great deal to him. I wish them both the happiness they have waited so long for and deserve. 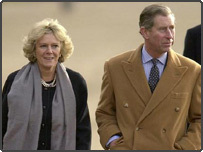 Yes, Prince Charles should be able to marry Camilla, they obviously love each other. Most other people have had a second chance when things have gone wrong with their marriage, and many have found true happiness the second time around. I sincerely hope that they are very happy, and that they are left alone by the media to get on with it. Never mind whether they should get married or not - we should be asking why we actually still have a royal family in the year 2005. It's ludicrous. Everybody seems to be bleating about "Christian Values" and how by marrying a divorcee Charles doesn't have any. Absolute pish and tosh! Whatever happened to forgiveness, compassion, love and loyalty? I'd say he had those in abundance - why is an anachronistic attitude to the marital status of his partner the only thing that matters? Charles will be head of the Church of England, a church that was created to allow a king to divorce and remarry, yet all of a sudden that's frowned upon?! Sort you lives out everybody and let the poor man be happy. We have no idea how much soul searching he has done to get to this point. Good luck Charles and Camilla - no one has the right to deny you happiness, for any reason. Charles and Camilla should marry if they wish. Given the moral vacuum that HRH The Prince of Wales resides within, he should without question forego his right to accession. He always has and will always be "judged" by the highest of standards - ones he has so far miserably failed to achieve. A future Monarch should be required to have the respect of the majority of the nation, it is my opinion that Charles will never have that. Dammed if he does, yet dammed if he doesn't. Therefore better to be dammed for marrying and enjoying their lives together. Good for them and I hope all goes well, but I, and I suspect most British people, do not care much. We no longer have to prostrate ourselves to them or risk legal sanctions or even death. It is sad that something so trivial fills the front page of the news sites and the papers. The media are wheeling out the usual stream of sycophantic toadies to spinelessly fawn over the Royals. Heaven help us all. Why shouldn't they marry? Diana died 7 years ago - it is time Charles is allowed to move on. Good luck to them both! It's disgraceful that a divorced person be allowed remarry whether they are royal or otherwise. A modern day Henry VIII, manipulating the constitution for his own ends. The magic of the Royals was lost when Diana was interviewed on TV and told us how her husband and in-laws were so "daunting". William was interviewed at St Andrews and was inarticulate with none of the "Queen's English" left. Harry's behaviour shows us how the Royals care about the education of the future generation. There is nothing positively special about the British Royals and they are an embarrassment. Enough is enough. Time for them to go. Absolutely! This should have happened years ago. It is wonderful to see the smile on the Prince's face now. They look extremely happy! God Bless both of them! Congratulations to them both, it's about time. We all know and many hate the fact he had an affair with her whilst married to our beloved Diana but the past is the past and he has every right to marry just as the rest of us with a failed marriage behind us do. I think he should become King if he wishes but am pleased that Camilla wont take the title 'Princess of Wales' with Diana still so clearly in our memory. How can a divorcee gain an HRH title and yet Diana lose her HRH title! This royal family is a highly subsidized joke. Charles should never be King and Camilla should earn her keep like the Princess Royal. What a nice set up the British public have paid for all these years. Marriage is their personal decision. Would have saved two lives from being affected if they had married 30 years earlier, but seems then as of now Charles does not have the courage of conviction of his grand-uncle, Edward. Do Marry, but give up the throne. Life is not a rehearsal!! They should enjoy the rest of their lives being happy - after all they are not kids. The past is long gone look to the future. No, they should not marry. And if they do? Charles should step down... and pass the title(King to the Throne) to his oldest son William. These people are not "ordinary", they are public property, paid for and kept by the long suffering British taxpayer. As such they should be setting an example of total moral codes, in public at least. Come on the republic of Great Britain. The public has demanded much of the royal family in the way of modernizing their ways, now it is the public's turn to "get with the times." We can still love and honour Diana. That will never change. Congratulations to both Charles and Camilla, their devotion to each other has been proven. A strong partnership will be good for the monarchy. I am delighted for the Prince of Wales and wish him and his bride to be every future happiness which they truly deserve. I would have no objections to Camilla becoming queen - she would be excellent and will certainly help Charles to be a better king. In the meantime, Long Live the Queen! Praise for Camilla being "discrete" makes me laugh out loud. Of course she was discrete - she had an affair with a married man whilst she was also married. It's not discretion, it is deceit. Neither have any credibility for breaking the vows they made before God and one of those parties still intends to be head of the Church of England. If they are such soul mates they don't need anything else, so marry but play by the rules which they have both always known, spare us the humbug and go quietly. I have a high regard for the Prince and like most loved Princess Diana, but we have to move on! So yes, marry Camilla and be happy! At last Charles is marrying the woman he has always loved. She is a great stabilising figure in his life and hopefully for all the royal family and more notably for the two princes. Good luck. Well Charles has made a nonsense of the monarchy already, making his mistress Princess Consort should he be crowned King will undoubtedly make the British Monarchy a bigger joke than it already is. Charles should allow the throne to go straight to William, at least then the British People would have somebody they respect and not someone who has already, in my view, tarnished the Throne. I rejoice to hear the final coming together of two persons whose love stood the test of time and public scrutiny. I cheer them for their strength and patience to wait so long not for their own sake but for the sentiments of their people whom I believe they do care more about than their own needs. Very weird. It seems to be the closest the palace can get to having their cake and eating it. I cannot think of a historical precedent to Princess Consort. I think Charles should allow the throne to go straight to William. Another nail in the coffin of the monarchy! Let them marry, live in private... and for Charles to forego any ascendancy to the throne - for the sake of genuine moral decency of our constitution. They should have got married when they first met all those years ago - it would have saved everyone a lot of heartache. The announcement of The Prince of Wales and Mrs Parker Bowles intention to marry has gravely upset me. The idea of Camilla obtaining a title should not even be entertained. The law should be enforced and require Charles to abdicate. To add insult to injury the very idea of not being married in the Church of England is even more upsetting and embarrassing. The British Monarchy is the head of the Church. He can get married but he should abdicate. God Save the Queen. Long Live HRH Queen Elizabeth II. I think they deserve happiness. There are many divorced and remarried people in today's society and no-one objects. I wish them every happiness in the years that lie ahead. They are already together so they may as well get married. If the princes can accept it then that is all that matters! Yes, Prince Charles should go ahead and marry Camilla. This is good news. Those who suppress desires only do so because theirs is weak enough to be suppressed. Their unwavering resolve during the years is testimony to their dedication to each other. They have been through a lot together and I am glad they have coped well. Whether you are a royalist or not, it is hard not to wish them luck. Remember they are humans just like any of us. Let us draw a line and move on. Best of luck Charles and Camilla. May God bless the wedding. Congratulations to the couple - after 35 years of deep love they can finally be together. I would say it's rather hypocritical that people did not put down Diana and her string of romances (both during and after her marriage) and yet jump all over Charles who has only ever loved one woman - and was told he couldn't marry her as a young man. I have always been in favour of the monarchy, but unless Prince Charles gives up the throne in favour of Prince William I will no longer feel able to support the monarchy after the death of Queen Elizabeth II. Oh great, now someone else will be paid a living by the British public. The youth of the nation is sick of this royal family, and we're not looking forward to giving these people a good life. I am perfectly relaxed that the Prince for whom I have high regard, and Mrs Parker Bowles should marry. Much stupid comment is made regarding her title on the Prince becoming King. Prince Philip who is the father of the next king, did not receive the title of King, but of Prince Consort. No-one objects to that. Mrs Parker Bowles is not the mother of Prince William and so could not be the Queen Mother on Charles' death. The title Princess Consort is, in my opinion, therefore, entirely appropriate and in order. I have always had respect for the Prince as he has maintained discipline to be only with Camilla where he could have had several affairs. We wish them the best of all! Surely one of the tenets of the Christian faith is forgiveness - I wish them every happiness. Yes they are made for each other but he should abdicate in favour of William. He cannot be a king of morals with his history. I would say to all those who will complain about Charles marrying to just shut up and mind their own business. The Church of England allows people who are widowed to remarry. Charles has every right to marry again just as the rest of this country do. He has acted as an ambassador for this country more times then any politician. If people are not happy with the proud history of this country I suggest they pack up their bags and get out and stay out. I am delighted to hear of the marriage of Charles and Camilla as they both deserve the happiness that they will soon get. Prince Charles should not be allowed to marry a divorcee especially one who was so constructive in the downfall of his first marriage. She is simply a glorified mistress. To tell the truth I don't really care if they get married or not. All of these pompous goings-on from various royal commentators saying that it's not right etc is a load of rubbish. It's succeeded in turning my generation (17) into a bunch of people who are completely apathetic of the royal family. It's about time! When two people who have obviously loved each other for 35 years, it proves that they are truly soul mates and have a deep and abiding relationship. I wish them well and the UK should follow suit. I think it is high time the royal family learnt from repetitive blunders. May the prince's son, heir of the throne be able to avoid any fatal mistake and marry the one he genuinely wishes to. It is an overwhelming moment for the Prince of Wales. Best wishes to them both. Not acceptable at all. If he knew her after Princess Diana's death then that would be a different story. But being the third party while Princess Diana was alive, that makes them both guilty! I wouldn't care if they are both together, but why should they choose this marriage? It's absurd and what kind of example is the future king proving? It really puts me off respecting him if he becomes the king! I think he should bypass his kingship to Prince William. About time too! Life is too short, the Prince deserves some happiness. Who else waits until his 60's to take up the job he has been trained for? There are too many double standards around this issue. Do we give every divorcee this degree of long term comment and hassle? There are many remarried divorcees and surely there are far more important issues for our concern. Let the churches concentrate on the core issues on which they agree so that they can work together and put aside the minor human differences that separate them. I'm happy to finally hear this. This man has loved this woman for 30 years and they were meant to be together. No one will deny that William and Harry are something good that came of a not-so-good marriage and everyone in the world loved Diana, but I believe these two are soul mates. This is a sad day for the UK. I for one won't be celebrating their marriage. Charles should abdicate and William should be King. We really need to remember that Prince Charles is still a human. It would be unfair for him if he isn't allowed to remarry as many people have today. If he really loves her then why should it be bad? He should practice what he preaches. As head of the Church, he preaches no remarriage to divorcees whose previous spouse is still alive. Do we want a hypocrite a King, as well as head of the Church? I think it's great, happiness is hard to find. He will still make a good King and now it will be with the support of the woman he loves. Camilla is obviously a good and kind woman who understands him, she has waited in the wings for long enough. I am not surprised that they are to be married although can't say I agree with it and I don't see why Camilla should be given a title of any sort. I suppose the most important thing is that the Princes are comfortable with it. What wonderful news indeed!! All that matters is that Prince Charles and Camilla love each other. The Queen has given her blessings and Prince William and Prince Harry have accepted her. Princess Diana died with her lover Dodi eight years ago. Its time to move on for Prince Charles. I am very happy for the couple and wish them both happiness and long life together. Charles and Camilla are obviously extremely dedicated to one another. They deserve to be happy. Camilla, has always been so dignified and I think she will make a brilliant addition to the Royal family. I wish them all the luck in the world! Yes they should be allowed to marry. In this day and age we should admire their commitment and despite previous problems they should be allowed to be happy for the rest of their lives. I think that as long as they are both happy and William and Harry don't object then we shouldn't either! Just because Charles is royalty that doesn't stop him being human! He deserves some happiness as much as the next man. Who really cares! Let them get on with it, preferably in private, without all the media coverage and without wasting tax payers' money. Although, it already appears too late for that - earlier today, BBC One "joined" BBC News 24 at 10am for constant coverage of the "announcement" - showing the same reports, with the same reporters, showing the same footage over and over again, until the One O'clock news which then contained a further 18 minutes of the same reports and coverage. Nearly 3 and a half hours of coverage, plus a "News Special" being shown this evening. Whilst I agree that there is a need to report this event, can it really justify this amount over media coverage! Never should Charles be allowed to re-marry - especially to a divorcee. This is a good reflection of our country today. He also should forfeit the right to be king, as the rules are rules. If the law is changed to accommodate this, then we will riot. God help us, another Royal wedding with all the attendant nauseating press coverage. I am happy for them to marry, but do not like the title HRH. What about her children - do they now receive titles? They are a disgrace to the country. Neither makes any useful contribution to society. The media are mainly to blame for their antics - and it's time the media ignored them, and hopefully we'll move out of this medieval system into a modern day democratic country. Why all the fuss? Charles is a man of his word and I believe that he recently said that should fox hunting be banned, he will be off abroad skiing for the rest of his life. So good luck to them, leave the rest of us in peace. Give us a Bank Holiday so we can all enjoy the occasion, as in 1981! Finally, a decent woman who will not try to out shine the Prince of Wales. Camilla has the right stuff to fit the royal part and also be a good wife. It is encouraging to see the UK still has some decency. I am very happy for them both. I have a great deal of respect and admiration for Charles, for the charitable work that he does and the way that he tackles important, seemingly boring issues, such as organic farming. From the news report it looks as though a low key wedding is planned, although I'm sure there will be lots of media coverage, not because the couple will want it, but because of the demands of the media, driven by the public. I think that the decision to not make Camilla Queen is a sensible and pragmatic one that does show sensitivity. Charles should only marry Camilla if he intends upon stepping aside and letting William take the throne. By marrying Camilla he is breaking the rules of the Church of England, and as the next king he would be the head of the Anglican Church. There has been enough hypocrisy in this man's life, and he has done enough damage to the monarchy. He should step aside and let William take the throne. These so-called 'rules' about marriage, religion and royalty have been evolving for hundreds of years, and they continue to do so. These calls for Charles to abdicate are just ridiculous. The world is changing faster than ever before, so you can't force him to live by 1930's rules. Name me one job (outside of the Catholic Church) that says you can't be married? If their personal choices are to be married, no one is going to stop them. As for Charles ascending the throne¿ Camilla is not going to be Queen, as stated, so where is the problem? This is the 21st Century not the Dark Ages. It's Just one more head to 'metaphorically' roll, when we finally become a republic. Everyone, even Princes or Kings, must have the right to marry the person of his own preference. Moral or religious restriction return us to medieval ages! Yes they should marry. Everyone else remarries so why not Prince Charles. Good luck to both of them. The marriage, which will occur regardless of what the public thinks, needs to be paid for by Charles, not our taxes. As for Camilla receiving a title, I do not agree with it. Let us not forget, that Royals are ordinary people living an extraordinary lifestyle at the expense of the taxpayer. As an individual he is free to marry whom he chooses. Likewise as a Prince. The problem arises if he expects to be King. This is where the problem begins. Many people in the UK will not tolerate Camilla being Queen, regardless of the Palace appearing to 'think' that might change by the time he becomes King. If he wants to be the last monarch in GB then go ahead and make her Queen. I suspect he will get a nasty shock. If the Royals were allowed to marry who they loved then history would be quite different. I agree that the sham of a forced marriage would have made for happier lives in the past decades. They clearly have always loved and supported each other through thick and thin and more than most of us go through to get married. Loyalty and love should triumph in the end. And you only live so long so why shouldn't they be happy. They have definitely proved their love. In the end it can only be good when their family supports it. More marriages around the world should be like theirs. It's about time they got married, though I think it's silly to make her a Duchess and not a Princess of Wales. Camilla should be styled as Princess of Wales and when Charles succeeds his mother, Camilla must become his Queen Consort. If, when Charles becomes King his wife becomes HM The Princess Consort the whole business is obviously a fudge to placate considerable public distaste, as Her Majesty she will, in all but name be his queen, or will she remain as HRH. I believe as Charles Windsor he is entitled to do what he wants, but as my future King and given there history, he should abdicate his right to the throne. Good grief, why on earth not? Hope they're happy. I find this outrageous. How can anybody become head of the Church of England with this track record? This is great news. They seem to have made all the right decisions regarding her title and where to get married. What a pity that so many of those that choose to criticise cannot get their facts right - Camilla is not a Catholic - her ex husband was, but she did not convert. In my opinion, Charles should have had the guts to marry Camilla from the beginning. It has turned out to be the same thing after all. He could have saved Princess Diana, himself and others close to him, a lot of heartache. If it was done in this manner, maybe then he would have had more respect from his fellow Britons. The time has come to let Prince Charles get on with his life and marry a woman who has held herself with dignity through hard times caused by the British media. Good luck to both of them. I do not understand why he wasn't allowed to marry her when they met all those years ago. A lot of unhappiness would have been avoided. Good luck to them both. I think the public and press hypocrisy is ludicrous... separation, divorce, remarriage and even not getting on with the in-laws (from Diana's p.o.v) are all perfectly commonplace in our society and for the Royals to be criticised for living by these same standards is a shame. I am not sure how any ceremonial role for Camilla would fare in public opinion; I feel that we haven't grown to know her as much as the rest of the Royals and so she wouldn't exactly fit the bill for a state representative, for example. On the more personal level, though, I think they deserve every happiness. Sure he can marry Camilla but, not still be heir to the throne. After all, she is a divorcee. William should be the next king. Will we get a day off work on the 8th April to celebrate, do you think? He is the future King of England for goodness sakes! I have nothing against Prince Charles and Camilla getting married. I just wish that Charles should have been allowed to marry Camilla who he was very clearly in love with. Then Princess Diana would not have had to endure most of her adult life unhappy. It seems the majority of British people are against the marriage of Charles and Parker Bowles. Is it not time the British public were allowed a referendum on the future of the monarchy? All things considered I'm more interested in why so many people wanted to go to a midnight opening of a new IKEA store! Before anyone wishes to pass judgement on the Prince or Mrs Parker-Bowles, first examine your own life. If you are positive that you have never made any mistakes or led a sinless life, let us all know. The 8th April should be declared a public holiday in Wales so we can celebrate marriage of The Prince of Wales. In a word - yes. Finally our Royal Family has hauled itself into the 21st Century for the i to happen. Good luck to both of them- they deserve it! I think if they want to get married, that's fine, however there is lots at stake. Australia has and could be again on the brink of republicism. This will certainly open debate at the very least! Perhaps he should do as Edward did upon his marriage to Mrs Simpson, step aside and let William ascend to the throne. If the Monarchy wants to remain head of the UK and the Commonwealth, there is no surer way to do it than have William take over the reigns! Good solution - Duchess not Princess, Consort not Queen. Prince Charles has got it just right, I am happy for them both. I suppose for her it is better than being referred to as a bit on the side. They absolutely should get married. You can not live in the past. Live for the here and now and enjoy it I say.